Suffice to say, I had a good time. Friday was dyeing and fiber prep. I've got more photos here if you need more details on what I dyed, but Friday morning was a whirlwind. I did 3 lbs of fiber in 3 hours. 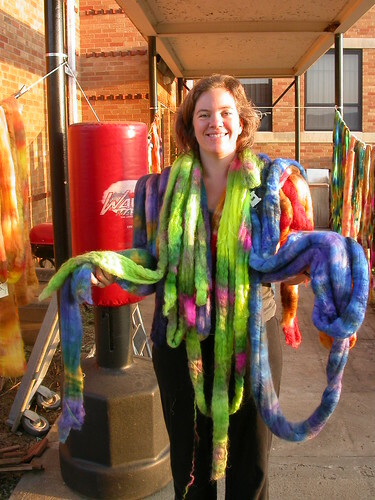 Of course, it makes a huge difference when you have a Dye Fairy around to mix up the dye and do all the rinsing for you. Clearly I'll have to train my kids to work a salad spinner and put them to work. but settled for some unwashed locks and processed roving instead. Friday afternoon, I was introduced to hand carding and drum carding, and got to try real woolen spinning. Whee! I made some mini-skeins from hand carded rolags, and then spun up a batt that I made on the drum carder. Definitely fuzzier and loftier then my usual spin. Some incredible Corriedale, dyed with brown, burgundy, chartreuse and orange. Sounds horrible in print, but the top was incredibly beautiful. Unfortunately I threw it on the wheel too quickly to get a picture of it, but there may be some over at the Yarn School Flickr group. Saturday was the big spinning day. 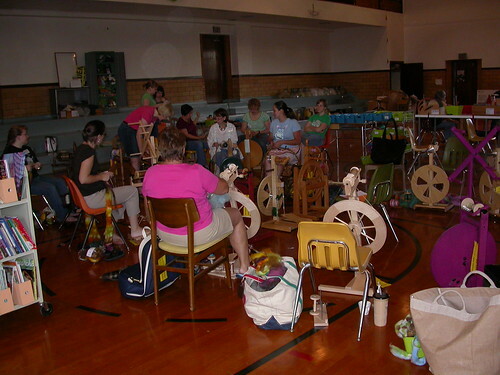 We had demonstrations on different drafting techniques, plying, spinning novelty yarns. Nikol and Jennifer also talked about raw fleece and how to pick a good one, and got one corner of the gym very sheepy smelling with piles of fiber all over the floor. I was intrigued enough to get some hand cards to play with, but I figure I can hold off on a drum carder for a while yet. 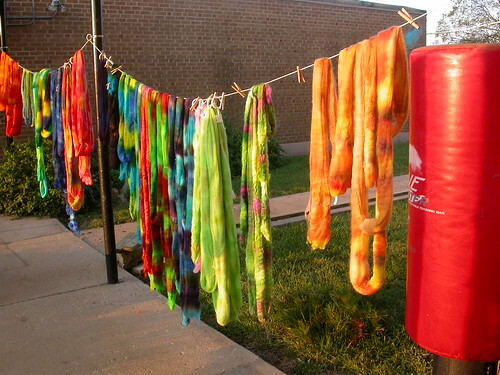 Between the goodie bag, the alpacas and the dye lab, I have enough fiber to last me for quite a while! Unfortunately I didn't get any pictures of the goats or bunnies (some pictures here) who came to visit on Saturday, but they were very cute and very soft, and thankfully I didn't have too much cash left by that time. Sunday morning I was up at 6:00 am to head back to the airport in Kansas City. I got back here, Ironman picked me up with the girls, and we dropped him off at the international terminal to go to Peru. It was a great trip, if exhausting, and I'm so glad I got a chance to hang out with some other spinners and try some new techniques. If we're still in country next year, I might have to think about going back. Written by porpoise On September 30, 2008 In "Yarn School", "dyeing", "spinning"